Heat gas or charcoal grill. In large bowl, toss 2 tablespoons of the oil, the pepper, salt, garlic and tomatoes. Let stand at room temperature 30 minutes to marinate, stirring occasionally. In large bowl, place shrimp. Drizzle with 2 tablespoons oil; toss to coat. Thread shrimp on 8 (12- to 14- inch) metal skewers, leaving space between each. Brush bread slices with remaining 2 tablespoons oil; set aside. Place kabobs on grill over medium heat. Cover grill; cook 4 to 6 minutes, turning once, until shrimp are pink. Add bread to grill for last 2 minutes of cooking time, turning once, until toasted. Remove shrimp from skewers. Add shrimp and basil to tomato mixture. 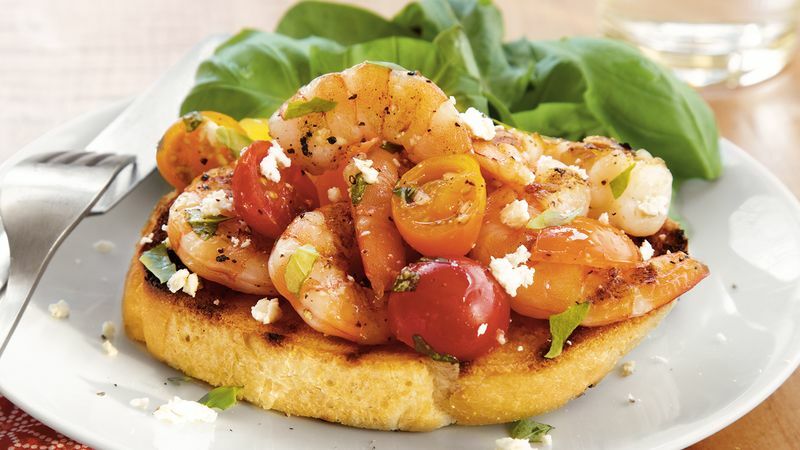 Spoon shrimp mixture onto grilled bread. Sprinkle with cheese. Serve with knife and fork.